We conducted mesocosm experiments examining the impact of nutrients and adult hard clams on juvenile clams and eelgrass. Hard clam densities used were both current and historical levels in Great South Bay at (0 or 29 – 43 individ. m-2) while nutrient loading rates matched those currently in Great South Bay and levels found in other northeast U.S. estuaries (1 – 10 mM m-2 d-1). High nutrient loading rates led to significantly higher phytoplankton (chlorophyll a) levels in all experiments, significantly increased growth of juvenile bivalves relative to controls with lower nutrient loading rates in two experiments, and significantly reduced the growth of eelgrass in one experiment. 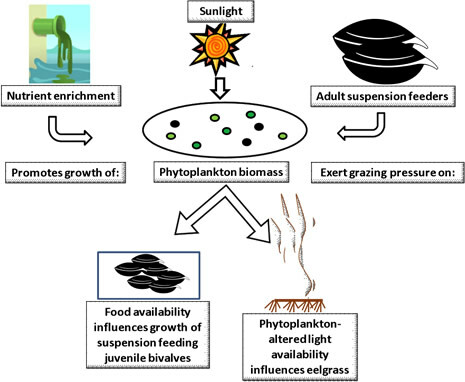 The filtration provided by adult suspension-feeders significantly decreased phytoplankton levels in all experiments, significantly increased light penetration and the growth of eelgrass in one experiment, and significantly decreased the growth of juvenile bivalves and fish in two experiments, all relative to controls with no filtration from adult suspension-feeders. These results demonstrate that an appropriate level of nutrient loading can have a positive effect on some estuarine resources, and that bivalve filtration can mediate the effects of nutrient loading to the benefit or detriment of different estuarine resources. Future ecosystem-based approaches will need to simultaneously account for anthropogenic nutrient-loading and bivalve restoration to successfully manage estuarine resources.